Diana Ross, Jeff Lynne's ELO, and more greats make for the landmark. The Hollywood Bowl, which will mark its first centennial in just a handful of years ("handful of years"=six years here), has a happy way of whetting our appetite for the pleasures of summertime at just the right moment. That right moment typically falls near the start of February, the time of year during which the Highland-close landmark typically announces its big roster of concerts and events. But the funny thing about the 2016 announcement, which arrived on Tuesday, Feb. 9, is that it felt as though it was arriving not in winter but the height of summer. Don't let the temperatures fool you, though: Summer is still to come and the bowl's slate is, as always, as starry as a big famous shell'd stage can muster, and it can muster a lot. 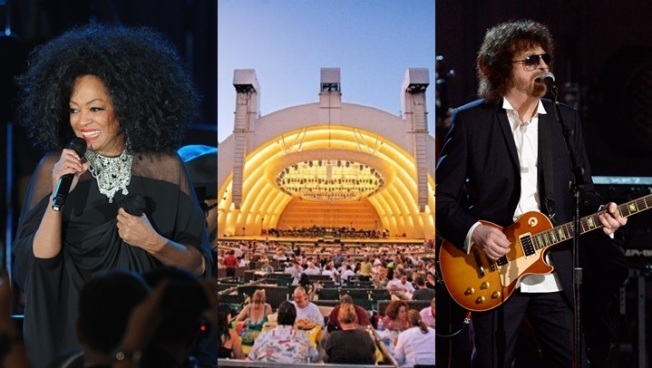 Diana Ross is a headliner for the 2016 season, gracing the stage for a Friday and Saturday in July. Brian Wilson's "Pet Sounds" is one of the buzz-makers of the Bowl, as is Jeff Lynne's ELO (the space-tastic optimistically orchestrated outfit has never played the famous venue). Steely Dan is part of the opening night celebration, and "A Chorus Line" is the musical set to bring sass and major names over the final weekend in July. Gladys Knight, Tower of Power, 50 Years of Jeff Beck, Herbie Hancock, Sigur Rós, Buddy Guy, Rodrigo y Gabriela, "Weird Al" Yankovic, Culture Club, and the forever-and-ever favorite "The Sound of Music" sing-along will be filling the 17,000+ seater with sounds of extraordinary quality and depth. And, as is tradition, there's the whole picnicking scene at the hillside haven of tunesmithing and history, a thing SoCalers have done since the wayback times of Tinseltown's earliest days. Days that included the Hollywood Bowl, a 1920s-era icon that is as vibrant as always. So how to get tickets? Subscriptions are on sale as of Feb. 9, with the "5 or More" packages available on March 15 and single tickets on the first Saturday of May. Truly, summer is not here, regardless of what the thermometer says. But it is on the way, as a certain early-February announcement from a certain historic venue reveals.